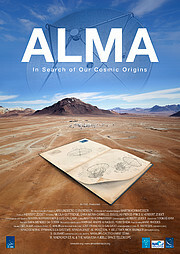 To mark the occasion of the inauguration of the Atacama Large Millimeter/submillimeter Array (ALMA)  on 13 March 2013, ESO, with its international partners, has released a new movie called ALMA — In Search of Our Cosmic Origins. This 16-minute video presents the history of ALMA, from the early days of the project several decades ago to the recent first science results. The movie is illustrated by dramatic helicopter footage and has a soundtrack that includes expressive music especially composed by Toomas Erm (ESO). You are taken on a journey to ALMA’s home on the Chajnantor Plateau, at an altitude of 5000 metres, in the unique environment of the Chilean Atacama Desert. The movie tells the story of the project from its earliest beginnings, when Europe, North America and East Asia developed a common concept for a new, large telescope for millimetre and submillimetre wavelength observations to observe the coldest and most distant objects in the Universe. It also charts the search for the perfect location and the technical and logistical challenges posed by the building of such a massive infrastructure under extremely harsh conditions and in a remote place.